I feel like everything nowadays is about productivity. It's all about getting as much done in the least amount of possible. Everyday things from fast food to express shipping to intense reliance on agendas, are all intended in order to get things done fast and to fit in as many things as possible into a single day. Our lives are fast-paced and always moving in an attempt to boost productivity. 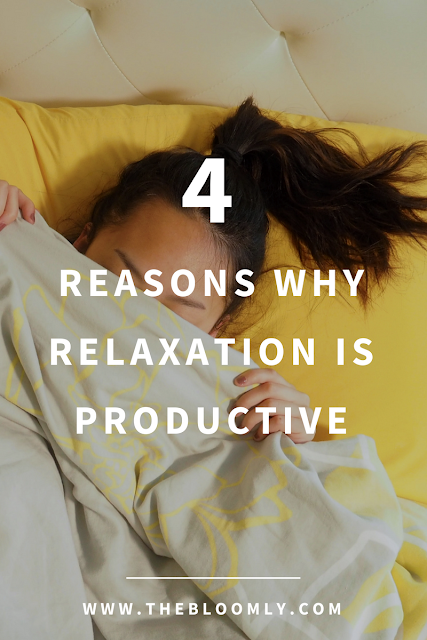 So if productivity is key, then isn't relaxation its enemy? It's long periods of times where no work and/or progress is getting done. In fact, sometimes I even feel guilty sitting down and watching one episode (and yes, I actually mean one episode, not two seasons), like it feels uncomfortable to be sitting there not doing anything. So does that mean that I'm wasting my time? While I was "wasting my time" the other day, I ended up coming across this quote that really stuck with me. That nagging guilt feeling that I have when I sit down and enjoy myself is the fear that I am wasting my time by doing so. I fear that I could be doing other things instead, more productive things. But upon discovering this quote, it occurred to me that my time relaxing might not be a waste, since it leaves me feeling happier. In turn, by feeling happier, I realized that I could even improve my productivity. Here are 4 reasons why. one. relaxation recharges you so that you can be more productive later. Relaxation allows you to thrive and find intense focus in your work. Let's say that after working all day, it has taken you 3 hours to complete that essay. However, with the rejuvenating effects of relaxation, you can achieve the same amount in maybe an hour and half. Since you're not burnt out and are able to completely focus on the task at hand and become more productive during your work hours. Think of relaxation as an investment. Think of relaxation as an investment. You put in some money and at first it might feel like a bit of a sacrifice. However, you know that eventually the money will pay off and you'll end up reaping the benefits, an even larger sum than you had in the first place. With relaxation, at first, you'll give up a little time, even though it might feel like it's a sacrifice to your productivity. However, eventually, the effects of your relaxation will pay off, even improving your productivity. two. relaxation decreases stress leads to better performance. Whether you're relaxing through getting some well earned sleep, watching the latest episode of Scandal (even though some episodes are far from relaxing), or sitting down and reading a good book, relaxation can be calming, you're no longer worried about getting things down, you can just enjoy yourself. Suddenly, all that stress that was plaguing you can just slip away. By spending time doing things that you enjoy doing, your stress levels are decreased. In turn, with decreased stress, you're able to work better, work harder. In addition, the more stressed you are, while you may be getting a lot done in a short time (productive!! ), you aren't actually working better, the quality is lacking. Relax, let go of the stress, so that you can not only get more done later, but also work better. By setting aside time for yourself to refresh and recharge, you avoid running into a creative roadblock and/or burning out. As aforementioned, relaxation is an investment. Or in this case, it's almost like insurance. You're taking prior action in order to form protection against a potential loss, burnout. Relaxation is like protective insurance against burnout. Relaxing allows you to shift your attention to other things so that you don't get bored or exhausted from doing any one thing constantly. Like insurance, although there's no guarantee that you'll never get stuck in a rut if you kick back and relax every now and then, it's an extra safety precaution that decreases your chances of burning out. While we often associate productivity with the production of physical goods, you have to remember that sometimes you need to work on yourself. You can be more productive with your overall life balance by relaxing. By doing so, you not only reap the benefits of increased work productivity, like the last points suggest, but you also reap the benefits of increased life balance productivity. You are using your time productively by improving your well-being. When you're trying to juggle everything you need to do, we often neglect ourselves, leaving that portion of our lives to become strained. By spending time on yourself, you're using your time productively to manage your own well-being. Being productive isn't just about getting things done, it's also about using your time well, and that means setting aside enough time in your life to work on yourself. Although all of the other points are fantastic, I believe that this one is the most important. It's important to have productivity ensuring that everything that needs to get done gets done, but you need to keep your own balance in life, ensure your own happiness and well-being, because that's also using your time productively, by setting aside time for yourself. While relaxation is productive, be sure to remember that there is a thin line between healthy relaxation and procrastination. Find your balance in order to find that peak level of productive relaxation. How will you productively relax? Yes to everything in this post! We've been conditioned to think that we must be hustling all day everyday in order to be successful. I found that I'm actually so much more productive and create better when I give myself time to relax then return to my work with a clear mind. It's 100% an investment! Me too! Glad that you agree!